These USB charging devices are designed to power up your electronic devices more quickly and reliably without the need of bulky AC adapters. 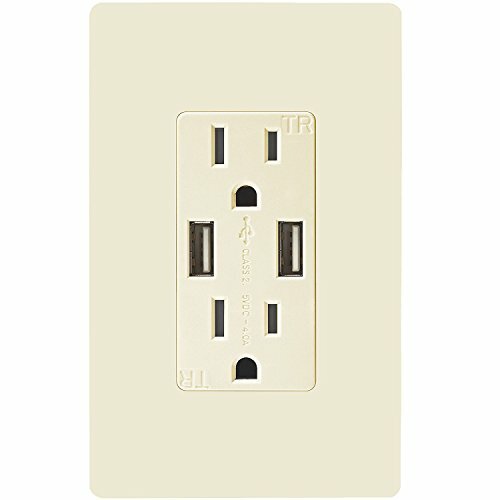 Charge one device or multiple devices from a single USB receptacle. Charge two devices simultaneously while leaving room to power other appliances. Compatible with USB 2.0 & 3.0 compatible devices. Total charging capacity of 4.0A. AC receptacles are tamper-resistant to meet NEC requirements. Back and side wire terminals accommodate #14 AWG - #12 AWG standard and solid copper wire for installation flexibility. Includes screwless wall plate and standard wall plate.